The Board affirmed a Section 2(a) refusal to register the mark DEPAUL for various charity-related services, finding that the mark falsely suggests a connection with DePaul University in Chicago, Illinois. The Board also affirmed a Section 2(d) refusal with regard to certain educational services included in the opposed application; that issue will not be discussed here. In re Depaul International, Serial No. 85323875 (June 18, 2014) [not precedential]. There was no dispute that applicant had no connection with the university, nor that the applied-for mark is nearly identical to "DePaul University." The school is referred to as "DePaul" and the word "University" is generic for its services. That satisfied two of the four elements of the Section 2(a) test. Applicant disputed Examining Attorney Charles L. Jenkins Jr.'s conclusion as to the other two elements of the test: whether the applied-for mark will be seen as pointing uniquely to the university, and whether DePaul University is so famous that, when the applied-for mark DEPAUL is used with applicant's services, a connection with the University would be presumed. Applicant argued that the recognition of the name "DePaul" stems from the use of the name and likeness of Saint Vincent de Paul, which is so "overwhelmingly present that 'DePaul' has gone beyond a name recognition and has become assimilated with service work, Catholic good will, and community dedication." Relying on the Notre Dame decision, Applicant pointed to several institutions whose names include the word "DePaul." In Notre Dame, the CAFC upheld the Board's ruling that "Notre Dame" is a name not solely associated with the University but also "serves to identify a famous and sacred religious figure and is used in the names of churches dedicated to Notre Dame, such as the Cathedral of Notre Dame in Paris, France." Here, however, there was "little to no" evidence showing DEPAUL used in connection with any person or entity other than DePaul University. 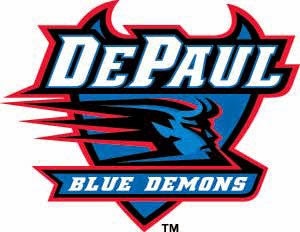 In sum, the record evidence showed that DEPAUL is understood as a unique reference to DePaul University. The Board found that DePaul University "enjoys a degree of fame in offering an array of educational services and is also known to place an emphasis on community outreach." It concluded that consumers who view applicant’s use of DEPAUL in connection with its recited services will believe that there is a connection with the university. "That is, Applicant’s use of DEPAUL in connection with services that include “employment counseling...leasing of apartments...educational services...[and] charitable services such as providing temporary housing...” will falsely suggest a connection with the University and must be refused registration under Section 2(a)." And so the Board affirmed the Section 2(a) refusal. TTABlog comments: Should a Catholic university have a demon as a mascot? In any event, I note, for what it's worth, that Judge Linda J. Kuczma, a Chicagoan, was on the Board panel that decided this case. She attended arch-rival Loyola law school.